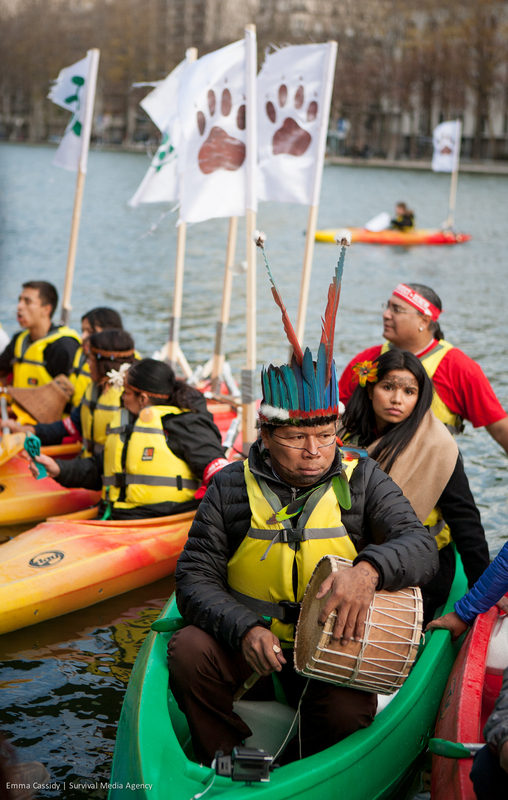 Last Sunday, 25 indigenous activists from around the world formed a kayak flotilla in Paris’ Bassin de la Villette, calling on world leaders to consider their communities when negotiating the first legally-binding international agreement on carbon emissions reductions. The action was followed by drumming, speeches, and banner drops demanding that the Amazon be protected and oil be kept in the ground. This demonstration took place a day after world leaders released the first draft of the climate agreement, which sets forth the commitments countries will make to reduce their carbon emissions. It is still only a draft — the final will be released at the end of the talks — but already, indigenous rights have been pushed out of the legally-binding agreement to a non-binding annex. Sunday’s demonstration was a space for international indigenous activists to voice their concerns that their rights and livelihood will not be included within the final document. Representatives from indigenous movements throughout the Americas took part in the demonstration. Patricia Gualinga of the Sarayaku region of the Ecuadorian rainforest was there, along with her niece Nina and other Kichwa activists. Indigenous women from Oklahoma, Canada, and the Brazilian Amazon spoke about their connection to the Mother Earth, and the disastrous impacts climate change has had on their communities. Also present at the action were Munduruku activists who are currently fighting Brazil’s hydroelectric dams, so-called “green” energy projects that displace indigenous people and wipe out ecosystems. The indigenous leaders released three declarations. One demanded a stop to fossil fuel extraction and investment in the industry; another asked for legal protection for the Amazon rainforest. The last announced the creation of a coalition of indigenous women throughout the Americas fighting climate change. 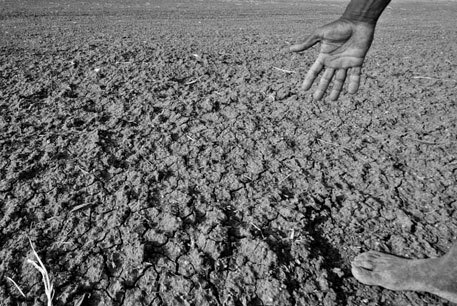 The negotiations’ potential for positive impact is suffering because of it: the final agreement is unlikely to keep us below the 2 degree Celsius increase above pre-industrial levels we have long understood to be a “safe zone” for the planet. Right now, even if all of the most ambitious pledges are included in the final agreement, we are on track for a 2.7 to 3.5 C increase, a level of warming that would be catastrophic. Already, climate scientists have revised the idea that 2 C is a “safe zone” and instead now believe that such an increase sits somewhere between “dangerous” and “extremely dangerous.” Activists and leaders from some of the world’s most impacted countries are now relying on the slogan “1.5 to stay alive” to push for emissions goals even below 2 C.
But climate negotiations aren’t what will save our planet: people-powered movements will. It’s only because of relentless pressure and organizing from grassroots movements that so many world leaders are even considering the carbon-cutting measures we need. Indigenous people have been on the frontlines of that push, fighting to protect the earth since even before we understood what climate change was. Our ability to survive on this earth cannot be separated from the justice work we do as feminists. Indigenous rights are climate justice, and climate justice is feminism.